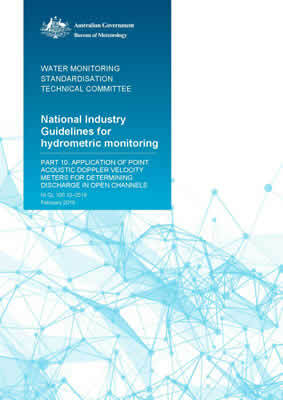 This document deals with the use of point acoustic Doppler velocity meters (PVMs) for determining streamflow in open channels. It specifies the required procedures and methods for collecting data by Australian operators. It specifies procedures for the collection and processing of surface water velocity data collected by PVMs. The document does not include or rewrite instrument manufacturers’ operating instructions for their individual instruments. Nor does it detail Standard Operating Procedure’s (SOPs) of organisations using these instruments. However, it is expected that those SOPs are sufficiently robust to withstand independent scrutiny. This document specifies requirements for the use of point velocity type acoustic Doppler velocity meters, training of operators and the treatment of uncertainty of measurements.